Five years ago, the US Space Force became a reality. And while those writing the checks took things very seriously, the other military branches did not. 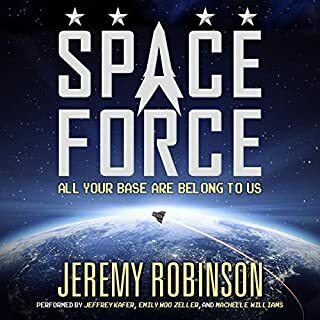 As a result, Space Force was populated by undesirables: men and women who made too many mistakes, didn't follow the rules, or...slept with the wrong general's daughter. Three times. On camera. It was a mistake, okay? My name is Captain Ethan Stone, a decorated member of SEAL Team Six turned Space Force "recruit". Crazy has no memory and feels no fear. Dangerous and unpredictable, he's locked away in SafeHaven, a psychiatric hospital, where he spends the long days watching Wheel of Fortune and wondering what the outside world smells like. When a mysterious visitor arrives and offers him a way out Crazy doesn't hesitate to accept. Mark Hawkins, former park ranger and expert tracker, is out of his element, working onboard the Magellan, a research vessel studying the Great Pacific Garbage Patch. But his work is interrupted when, surrounded by 30 miles of refuse, the ship and its high-tech systems are plagued by a series of strange malfunctions and the crew is battered by a raging storm. When the storm fades and the sun rises, the beaten crew awakens to find themselves anchored in the protective cove of a tropical island...and no one knows how they got there. Lincoln Miller, an ex-Navy SEAL turned NCIS special agent, is sent to Aquarius, the world’s only sub-oceanic research facility, located off the Florida Keys, to investigate reports of ocean dumping. A week into his stay, strange red flakes descend from the surface. Scores of fish are dead and dying, poisoned by the debris that turns to powder in Miller’s fingers and tastes like blood. Miller heads for the surface, ready to fight whoever is polluting on his watch. But he finds nothing. No ships. No polluters.... No oxygen. A chain of subglacial volcanoes erupt in Iceland. The melting ice floods the countryside. Poisonous gas descends on Scotland. A tsunami devastates the Norwegian coastline. An ash cloud rises into the atmosphere, blotting out the sun across Europe, ushering in a new Ice Age. Dozens of nuclear power plants, flooded by ocean water, experience meltdowns. Millions perish. Many more are displaced. All on the first day. Stranded in the Amazon rainforest, a lost man fights for survival and discovers that the root of evil doesn’t just reside in the world’s darkest corners, but inside the hearts of all mankind. Dr. Gregory Zekser is on a mission to visit the furthest reaches of the Amazon, providing medical aid to recently contacted tribes. As a general practitioner and food pantry director, his life in Massachusetts can be chaotic, but serving people is what he does best, and he doesn’t mind sacrificing his personal life to help others, at home or half way around the world. If you could go back in time...and witness any event...where would you go? When Dr. Tom Greenbaum faces that question after successfully discovering the secret to time travel, he knows the time, place, and event he will witness: the death and failed resurrection of Jesus Christ. Dr. David Goodman, Tom's colleague and closest friend follows Tom into the past, attempting to avert a time-space catastrophe, but forces beyond their control toss them into a dangerous end game. Not what I expected at all. Freeman is a genius with an uncommon mixture of memory, intelligence, and creativity. He lives in a worldwide utopia, but it was not always so. There was a time known as the Grind - when Freeman's people lived as slaves to another race referred to simply as "Master". They were property. But a civil rights movement emerged. Change seemed near, but the Masters refused to bend. Instead, they declared war. And lost. Now, the freed world is threatened by a virus, spread through bites, sweeping through the population. Those infected change - they are propelled to violence, driven to disperse the virus. The Galahad, a faster-than-light spacecraft, carries 50 scientists and engineers on a mission to prepare Kepler 452b, Earth's nearest habitable neighbor at 1400 light years away. With Earth no longer habitable and the Mars colony slowly failing, they are humanity's best hope. After 10 years in a failed cryogenic bed - body asleep, mind awake - William Chanokh's torture comes to an end as the fog clears, the hatch opens, and his friend and fellow hacker, Tom, greets him...by stabbing a screwdriver into his heart. This is the first time William dies. Once Homo sapiens reigned supreme, spreading from star system to star system in an empire that encountered no alien life and thus knew no enemy.... save itself. As had happened many times before, the most primal human instincts rose up, only this time armed with the advanced scientific knowledge to create a genetically engineered smart virus that quickly wiped out humanity to the last man. That man is Ruslan, the sole known surviving human being in the universe. I felt title and genre was misleading. In Level Five, the debut near-future thriller by Nebula Award winner William Ledbetter, AIs battle for dominance, and nanotechnology is on the loose. And all that stands in the way of the coming apocalypse is a starry-eyed inventor who dreams of building a revolutionary new spacecraft and an intelligence agency desk jockey faced with the impossible choice of saving her daughter - or saving the world. Techno thriller? Or hard science fiction? Either way, it’s excellent! Mere minutes after arriving at their Nantucket family beach home, nine-year-old Scotty Sullivan was out the back door, scrambling toward the shore with Larry, the family dog, fast on his heels. Late in the afternoon in mid-spring, the typical summer beach crowd visitors were still weeks away. Suddenly, Scotty became aware of an odd-looking object, hovering just above the crashing surf. In an age of hobbyist’s drones and all sorts of flying gadgets, he wasn’t overly concerned until the large flying object moved much, much, closer. 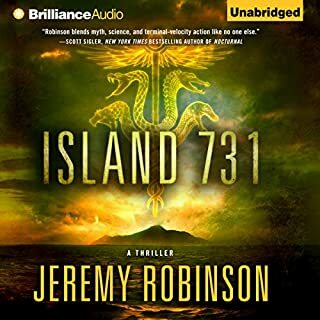 On the precipice of a cliff, contemplating suicide, dishonorably discharged US Army Ranger Rowan Baer is invited to provide security to a research team visiting the most dangerous island in the world - North Sentinel Island in the Sea of Bengal. Seeking redemption, he accepts. Living among Amazon rainforest tribes, eccentric Israeli anthropologist Talia Mayer is recruited to study the island's elusive inhabitants - the Sentinelese - who have resided on the tropical island since the dawn of mankind. The human race has turned to dust. August Morrison faces it after rising from the depths of a dark matter research facility in Arizona. His co-workers. His daughter. All of them: dust. Friends and colleagues around the world don’t answer their phones. The city of Phoenix burns. He is alone. As a world without mankind starts to crumble, August fights not just for survival, but for his very sanity. On the other side of the country, Poe McDowell watches her parents crumble into dust just moments after being shoved inside a coffin-like device that spares her from the same fate. She emerges to find not just her mother and father, but also her neighbors - her entire town’s human population - reduced to grit. Unlike August, she’s not entirely alone, but the life growing in her belly isn’t much company. Then, hope. A drunken and desperate August broadcasts over the ham radio network and connects with his fellow survivor, Poe, alone and pregnant in a snow blanketed New Hampshire. Determined to reach her, August sets out on a cross-country trek. But the world is not as empty as it seems. Lights in the sky reveal that they are not alone. The human race’s demise was not natural - and the architects are searching for survivors. 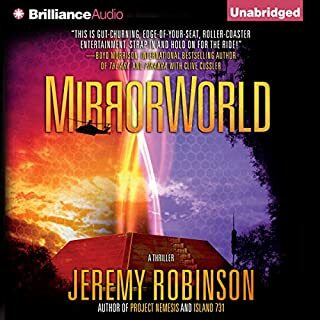 Jeremy Robinson, whose stories have been compared to Michael Crichton, James Rollins, and Stephen King, is the international best-selling master of stories featuring mind-bending imagination, terrifying monsters and high-octane action. 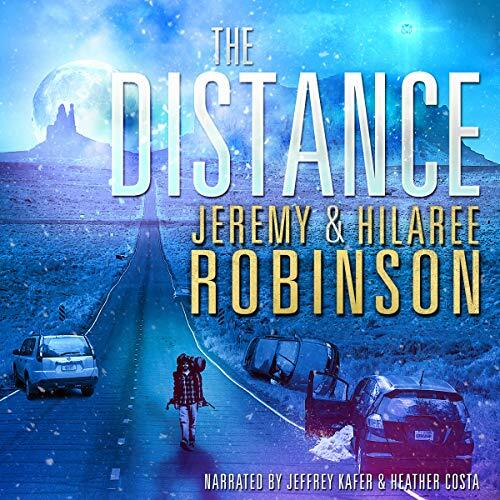 With The Distance, he is joined by his wife, Hilaree Robinson, whose passionate writing and characters make this novel a truly unique and exciting experience that will leave readers both enthralled and moved. I like the author - truly. The Others is a treat of a story to enjoy. Listen to that. This story, however, was like a nest of mosquitoes in my brain. The problem is the characters, and since this is a character-driven story, that is indeed a big problem. Most stories show a progression for their character. Accomplishing a goal, or mission - overcoming some obstacle, learning new skills - you get the idea. These characters? No. The greater irritation that drove me to abandon this story all together, was the female lead and her soul crushing repetition of "My baby, my baby!" Over and over ad nausea. Every nuance of any conversation, idea, or experience had to be examined, torn apart, then run up against her swelling belly. Ya, you're pregnant. Move on! 2nd on the irritation list was both characters complete idiocy. I know they were supposed to represent more of the everyday person, but with the stupid mistakes, horrible assumptions, and damage they inflicted on themselves, there is no way in hell either one would last more than 2 days. Yes, I see others have given this high marks, but The Stupid these characters represent is just too strong to ignore. Jeremy Robinson along with his wife Hilaree have created a book that I know will stay with me for years. It's one of those rare books that I know I will listen to over and over - picking up the foreshadowing I only briefly glimpsed. I've read or listened to many post-apocalyptic books but this one now ranks in my top three. The characters are so well defined and their emotions and reactions are all so real. I will miss them. I think this story could have been great. The performance is OK. The woman character is super naive and an annoying wus. As an example, She faces another person with flecks of red and wet looking red all over their clothes. She asks "have you been painting?" This is days after everyone has died. Another example, she kills a dog that's viciously trying to kill her. Afterwards she feels extreme guilt and wonders what someone else would think of her for doing it. Cars everywhere with gas in them, but a man thinks its better to ride a bike across the entire country. Whatever...I didn't like it. The Distance is a pretty interesting and unique tale of an alien "invasion", for want of a better term. Quite unlike and idea in that genre I've read or seen or heard before. The story was well contained, a "one and done", with all questions answered, and a satisfying story arc. As a reader, I was wondering what was going on, as were the characters, and as the story progressed you are able to get a better idea and make some guesses yourself, and in this case I was overall correct, but was a bit more complicated than I was thinking. 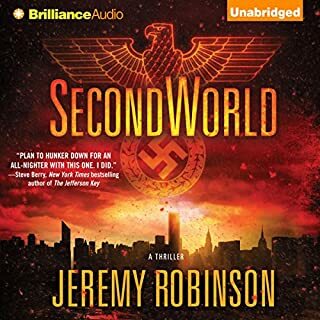 I'm a big fan of Jeremy Robinson's books, and of Jeffrey Kafer's narration, and have purchased many audiobooks featuring either of these. Hillaree Robinson and Heather Costa I'm not as familiar with however. I was pretty pleased to receive a free review copy of this new novel, both to hear two known artists I'm a fan of, as well as trying out two more. The style of the novel as well as the dual narrators assisted the story very well, and unlike a lot of novels where the book is continually flipping from one main character to another, it was pretty easy to follow - assisted even further with the dual narrators. Even with a single narrator I don't think I'd have had any issues following the story. I've never read anything else from this author, so I wasn't expecting anything going into it. I've read a lot of books in the same genre, but this one leaves them all behind. First off the Narators are perfect. At first I thought Jeff Kafer was a little too "rough" sounding for the character he was portraying, but after a few chapters you really get a feel for it and as the character develops, he fits perfectly. Heather was just perfect (I can't think of any better way to put it). One of my biggest pet peeves is when there are two narators and they do each others character voices completely different from each other, but these two do it flawlessly. The book is great, but these two make it 100% better. Now to the story. 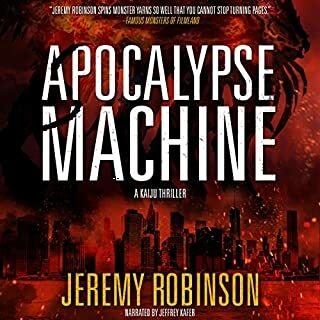 At the beginning I was thinking it was going to be just another apocalypse story with two dimensional characters with a cheesy love story tossed in. I was so happy to be wrong. The story is fun, tense, scary, and entertaining throughout. The characters are likable and believable. The whole story just works so well. The ending wraps the whole thing up perfectly without leaving you wanting. I recieved this book for free in exchange for a fair review. It felt awkward, I'm just not sure. I really struggled to get into it as a result. The gestalt of the story was a little stale but the motive of the aliens was unique and new. The performance was a major distraction. The female voice was like listening to nails on the chalkboard. The pitch and tone reminded me of the chipmunks. The male voice was slightly monotoned with a consistent decrement in inflection....kinda annoying.. I NEVER review books. From the first line I was hooked. Heather Costa is a female James Earl Jones! I could listen to her read anything. The story is incredible and I don't think I've read or heard one like this ever. I couldn't stop listening...on the way to the gym at 5 a.m., in the shower, in the pool, you name it. Fantastic! Don't miss this one. Was quite surprised with this book. I thought the premise and foundation of the book to be incredibly interesting. When I got it the conclusion I felt things were not answered as well. It seems to me it took awhile to figure out what exactly was going on. I kept listening and about 1/3 of the way in it started coming together. The characters are interesting, perhaps too interesting as the detail was part of the confusion. The aliens are also confusing, are they good or bad? They take a little while to show up, and even then they're actions and motivations develop slowly but are revealed at the end. The books is written in two primary voices, mail and female and the two narrators Jeffrey Kafer and Heather Costa are effective in making this work. Overall an interesting take on an apocalypse instead of the usual zombies and nuclear fallout. I was given this free audiobook at my request and have voluntarily left this review. First thing I thought of was why are you not wearing Face masks if everyone is dust aren’t they breathing in dead bodies? Shudder! But that’s just me! That did not affect my enjoyment of the story. Libary for books and a medical center to get info and pain meds for squirts arrival so I’d know what to do! and what I could take to minamise pain. But I’m a wuss! Neither of them knew what to do. The story starts at the very beginning and carries on very well. I enjoyed it! 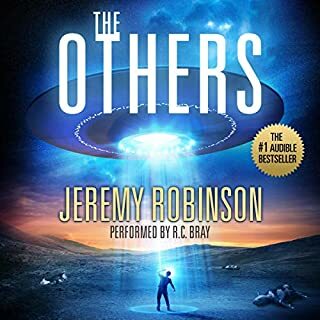 I do love Jeffry voice I have never heard Heather Costa’s before I did find it a bit jarring going from a male to female narrator I have had a lot of books just read by one person, I got use to it. It didn’t stop me from enjoying the book though. The distance that August had to travel meant it wasn’t a day by day telling of the story so it progressed very well. This book is worth a listen if you dont mind female narrators. Nothing wrong with her voice or anything just not for me. The story is slow to start but worth the wait. Very easy to follow but I found it a tad dire in places. The ending wasn't as I expected....and possibly could lead to a "part two". If your a diehard Si Fi fan....you could do better. However it's a simple story and easy to follow. This is the second book I have read from this author. Just gets better . The first 10 chapters are a grind but we'll worth the initial grind. story was OK but the male and female readers were somewhat annoying. The mans reading style sounded like an overdone action hero and the female's American accent was too strong and her sentences ended in a weird break every breath. The overall story was original and the reason that i stayed with it to the end, but the girl in the cabin sections were drawn out, overly detailed and boring unless your looking for an essay on pregnancy and child birth. I would recommend listening to Infinite, as it is a much better story, very original and the reader is great.